After the £38 departure of Thibaut Courtois to Real Madrid, the former Premier League Champions didn't waste no time has the broke the world record of signing the 23 years old Athletico and Spain international Goal keeper Arrizabalag KEPA for whooping amount of £72M from Bilbao. KEPA was born on 3rd October, 1994 in Ondarroa, Spain. He was on loan for a long time in Valladolid until 2016 when he had his debut in an away match against Deportivo La Coruna, he was granted this chance by Ernesto Valverd during his final season in Bilbao before moving to Barcelona. In November 2017, he made his first Senior team debut for Spain in 5-0 win over Costa Rica and was also among the Spain World Cup squad. GET IN: DOWNLOAD FREE APPS, MOD APK AND PPSSPP GAMES. 368 Long balls than any other keeper in LA Liga last season. 9 Saves against Real Madrid in April 2018, His best tally in a La Liga Match. He saved 2 of 3 penalties last season the second highest percentage in La Liga. 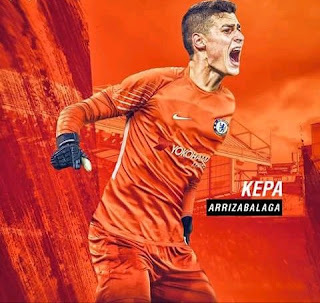 Kepa Arrizabalaga is known to be one of the best youngest goal Keepers around the world because climbing up there to become Bilbao's first Choice isn't an easy task now he's currently playing in one of the best teams in the world and arguably one of the most expensive Goal keeper in the world.